The General Assembly of the Christian Church (Disciples of Christ begins this evening. I will be in attendance. 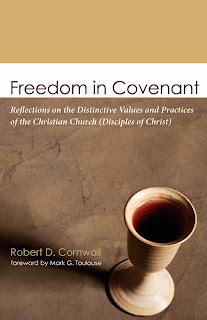 In addition, copies of my book Freedom in Covenant will be available in the bookstore. I invite you to take a read, and if you're a Disciple, I would, of course, recommend you get a copy! The religious movement that gave birth to the Christian Church (Disciples of Christ) burst forth on the American frontier early in the nineteenth century. This fact is important if we are to understand the story of who the Disciples are and what they value. What has come to be known as the Stone-Campbell Movement was marked from the beginning by a frontier ethos of freedom, anti-institutionalism, and individualism. You might say that this is a denominational tradition with a libertarian streak. In addition to its frontier ethos, the movement has been marked by its roots in the Reformed tradition, for the founders of the movement were first Presbyterians before taking the steps that led to the creation of a new American religious movement. While Disciples are heirs of the Reformed tradition, they, along with the other two major branches of the Stone-Campbell Movement, are marked by their points of resistance. This is especially true regarding demands for doctrinal conformity. As a result, Disciples take pride in being a non-creedal tradition. The Stone-Campbell Movement, of which the Disciples are but one branch, saw itself as an attempt at re-envisioning Christianity for a new century (the nineteenth century). Freed from the bonds of inherited tradition, it would chart a new course that would unite Christians everywhere in an evangelistic mission that would touch the world. The foundation for this effort was to be found in the pages of the New Testament. Freedom, unity, evangelism, and restorationism would be hallmarks of this new movement. Two important events served to form the identity of the Stone-Campbell Movement. The first event was Barton Stone’s participation in the Cane Ridge Revival of 1801, along with his subsequent break from the Presbyterian Church over theological differences. Secondly, the Scottish Presbyterian minister Thomas Campbell issued the Declaration and Address in 1809, in which he laid out his vision of a movement of unity among Christians. The first event links the movement to the outbreak of the Second Great Awakening, putting the movement in the middle of an effort to evangelize the new nation. The second served as a call to unity among Christians in the service of this task of evangelization. By leaving behind outworn beliefs and practices, these pioneer reformers believed, the church would be more effective in reaching the large numbers living outside the bounds of the church. In other words, the why of this new movement of reform was evangelism. Living on the frontier of a new nation, the founders of this movement sought to make the Christian message relevant to a new age. Much has changed since the early nineteenth century, but in many ways the Disciples continue to be a frontier people. Freed from the encumbrances of rigid traditions and rules, frontier people must adapt to their surroundings, making do with what they have at their disposal. Even if the Christian Church (Disciples of Christ) that exists today has become fully integrated into mainstream denominational Protestant Christianity, it is marked by unease with hierarchy, rigid traditions, and cumbersome rules. In theory, this is a denominational tradition built for an age when growing numbers of people are questioning the value of institutional religion. You can also purchase a copy of the book, to read more, from Amazon or from Wipf and Stock.